Please note that any rates listed below are subject to change without notice. The Mill Creek 18-Hole Golf Course and Mill Creek Lake is one of the best kept secrets of the Gulf Coast. It nestles in a picturesque setting of piney woods spotted with dogwood trees and skirted by a 100 acre lake. The golf course features a well stocked proshop, a clubhouse café with all the amenities, and lessons by appointment. Annual fees are available and senior citizen fees are unbelievably low. There is a men's and women's golf association meeting monthly. On April 3-4-5 of 1999 this Golf Course was the Course-Sponsor for the Emerald Coast Golf Tour for the Pro-Am. For further info contact at the above address or phone number. 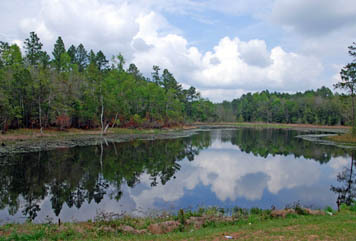 Mill Creek Lake, which skirts the golf course, is regularly stocked with Florida large mouth bass, catfish, brim, and crappie. The lake also provides swimming, regular boating, paddle boats, nature trails, and RV Park with 38 lots. For those not into chasing that white ball, the lakeshore sports an 18-hole disc golf course. The R. V. Park consists of 24 sites that back up to the 100 acre lake, 7 pull throughs, and 7 sites that back-upon the hill over looking this lake. Sites have 30-amp and 50-amp power hookups as well as telephone hookups. Directions: North on I-65, take exit 13, 158 West to Hwy 45, North to County Road 96 until you come to a sign that reads "Citronelle Municipal Park Complex." Follow the signs to the R. V. Park (you must pass the golf course and the disc golf area). Citronelle Memorial Library was formed in June 1893 using 500 donated books and an annual fee of $1.00 for their use. Today, the Library is fully accredited in Mobile County and in the Alabama Library Association. In addition to books, the library offers a video and audio library and six computers with access to the Internet. A copy machine is available. Black and white copies are 15 cents; computer printouts are 30 cents. HWY 45 at State St. The Citronelle Senior Center is a center for the senior citizens in the Citronelle Area. The center continuously involves seniors in programs to keep them socializing and informed. The Center has a Diabetic Shoe Program each year. The doctors come to the center to measure the feet of diabetics and give helpful hints to care. The Medicare Program then buys the correct shoes for the diabetic senior. Parks and Recreation Department provides an annual trip; in 1998 the seniors went to Shocco Springs and in 1997 to the U.S. Space and Rocket Center. On a monthly basis the seniors go on a shopping trip and out to eat. A free blood pressure check is done monthly at the center also. Operating hours: Monday through Friday from 9:00am until 1:00pm.